A specialised product that may prove too pricey for some, but it provides authentic old-style echoes in a very fuss-free fashion. Top-drawer construction. Excellent, user-friendly performance. All extras included. The price, and very little else. Fans of David Gilmour are sure to love the AGE-Pro. It's not a cheap delay effect, but it is a fantastic one. Established by ex-Hagstrom employees, Amtech's core business lies mainly in the hi-tech and computing sector, but this Swedish company caters for the music market via a brace of guitar-orientated analogue echo units. The AGE-One appeared in the late-'90s and was later joined by the larger AGE-Pro, which has recently been refined via some circuitry tweaks and component upgrades. 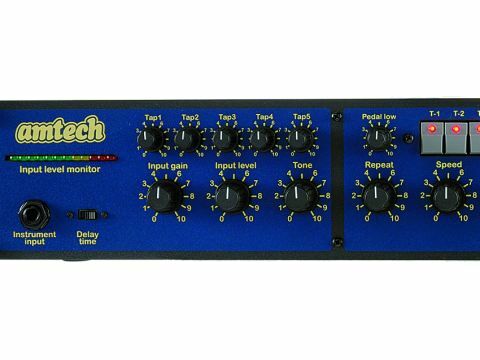 "The end results accurately emulate many classic echo machines from the past, successfully adding warts and all authenticity." Although it can be used with other instruments, the AGE-Pro is aimed primarily at six-string players, hence the 'Guitar Echo' legend on the fascia. The latter fronts a 2U sturdy steel casing that can be rack-mounted or used free-standing. The logical control layout is much the same as on the previous AGE-Pro. One change concerns the five tap trim pots previously located at the rear. These are now on the front to enable quicker, more convenient level adjustments of the unit's five 'virtual' replay heads. Below this row is input gain, which governs guitar volume, while input level and tone affect the echo content. An LED array indicates incoming signal strength and underneath is the revised AGE-Pro's other obvious amendment: a Delay Time slide switch that selects different time intervals before the first 'virtual' tape head comes into play. Next come pots for repeat, speed and flutter. The first regulates effect repetition, the second alters the rate and the third adds a mild modulation to emulate the mechanically induced aural deficiencies of old echo units. A pedal low pot lets some echo through even when the accompanying foot controllers are in bypass mode. This central control section is completed by five tap select switches, each engaging a 'virtual' replay head and able to be used in any combination to create various echo patterns. Over on the right, echo level varies effect volume and last in line is an eight-way mode switch. The first six positions provide different pre-set echo patterns; the seventh option operates the five tap switches, and the eighth activates the relevant tap level controls. All connections are standard jacks and the instrument input is thoughtfully duplicated on front and back. The rest are rear-mounted and comprise line in and out, the latter being effect only, while a second output adds the direct signal. A final jack accommodates the included echo volume pedal, which constantly varies the effect level. Also featured is an on/off footswitch. Despite the user-friendly controls, exploring the echoes on offer does take time, as the menu is sizeable to say the least, spanning what seems to be every possible permutation of tape delays and cascading echoes, plus all manner of multiple repeats. But the effort is worth it, as the end results accurately emulate many classic echo machines from the past, successfully adding warts and all authenticity to an inherently cleaner and quieter performance. This impressive combination should ensure the AGE-Pro finds many friends, especially among those players who prefer red Fender Strats and, er, Hanker after old-style instrumental sounds. Indeed an included sheet of suggested settings for various Shadows tunes clearly hints at Amtech's target market, although, as the AGE-Pro accurately mimics vintage Binson sounds, it should also attract fans of David Gilmour keen to emulate his echo- tailed, Floydian textures. The Amtech AGE-Pro is undoubtedly far from cheap and occupies an increasingly niche market, although this sector is peopled by many players who aren't afraid to spend during their search for 'that' sound. In this instance, big money buys a quality product with performance to match, unlike the age- and design-related drawbacks of over-priced vintage echo units that consistently disappoint and constantly demand attention. All of which makes Amtech's modern alternative even more attractive and better value.